Quilting can take such unexpected turns with everyone having their own voice. Look, Listen, Enjoy - Hope to See You There !! @ Holy Spirit Church @ 7:00 P.M.
onto N. 2nd St. Faith Presbyterian is 3 blocks on the left. LEFT onto Cherokee. Parking lot is on Right. No Meeting - Election Day - Time to Vote! Raffle Quilt Winner Chosen !! We had a Winner !! 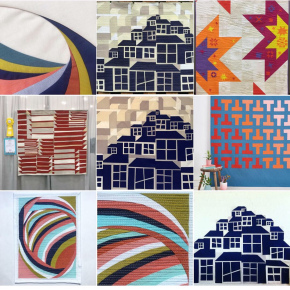 "Every Quilt Tells A Story"
It has been a very exciting year - Join Us for new and eventful meetings ! !